[AUTO](VC/RC):When it attacks or boosts a rear-guard, COST [Soul Blast (1)], put the top card of your deck into your drop zone, and perform one of the effects below depending on that card’s type. • Normal unit – Your opponent cannot call sentinels from his or her hand until end of that battle. 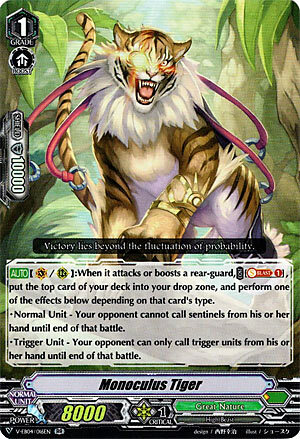 • Trigger unit – Your opponent can only call trigger units from his or her hand until end of that battle. Prepare to meet the near unblockable Zoa for Premium! With Talented Rhinos plus this you have something that can help to get rid of them presky Sentinels that plague Zoa so. Anyway, for Standard format he’s a little less stable. However it IS worth noting that whatever you mill does at least seal off Protect Gifts for the entire attack, so it hurts decks like OTT a little as long as power is really high. Sadly he only gets to boost RGs for his skill, but really the skill is optional and at 8k power he isn’t necessarily interfering with anything on the board by existing. He gets to stay, if only because we’re still fresh on GN support and there’s bugger all else to run anyway.